His Majesty King Hamad bin Isa Al-Khalifa today received at Sakhir Palace, in the presence of His Royal Highness Prince Salman bin Hamad Al Khalifa, the Crown Prince, Deputy Supreme Commander and First Deputy Prime Minister, retired US General Anthony Zinni and Deputy Assistant Secretary of State for Arabian Gulf Affairs in the Near East Bureau at the U.S. Department of State Tim Lenderking, marking their visit to Bahrain as part of a regional tour. HM the King welcomed the two US officials and reviewed with them deep-rooted historic relations binding the two countries and means of further strengthening joint ties, hailing steadily-growing cooperation in all fields. He commended the US Administration for its strenuous efforts and pivotal role in bolstering the pillars of peace, security and stability in the region, affirming Bahrain’s unwavering support to regional and international endeavors and the establishment of mechanisms for joint cooperation between the United States of America and countries in the region. The US envoys commended HM the King’s role in strengthening Bahrain-US outstanding relatons and bolstering joint cooperation for the sake of the two countries’ interests. HM the King exchanged with the US envoys viewpoints regarding a number of issues of shared interest, in addition to latest regional and international developments. 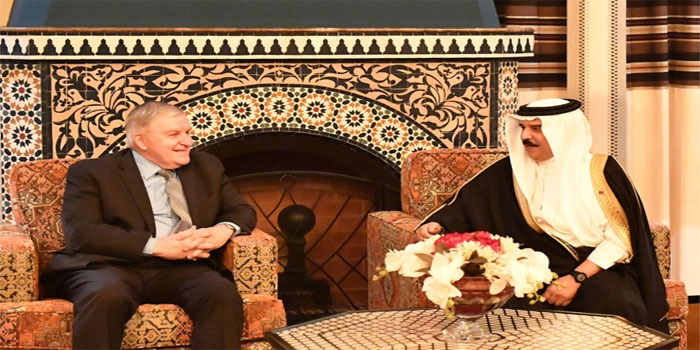 HM the King hosted a dinner banquet in honour of retired US General Anthony Zinni and Deputy Assistant Secretary of State for Arabian Gulf Affairs in the Near East Bureau at the U.S. Department of State Tim Lenderking.